This is a fantastic opportunity for teens 15-19! Some more info. . . 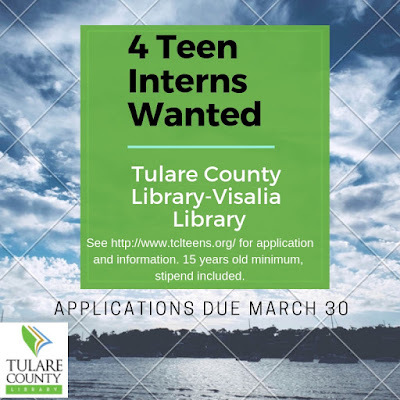 This position is open to teens ages 15-19 through the generous Friends of the Tulare County Library Scholarship. A stipend of $250 - $300 will be awarded to the intern(s) upon successful completion of the Visalia Branch Library’s Summer Reading Program Internship. Up to four interns will be selected. Previous interns may apply. · Available a minimum of 12 hours per week during the Summer Reading Program, which runs from June 12th through July 21st. 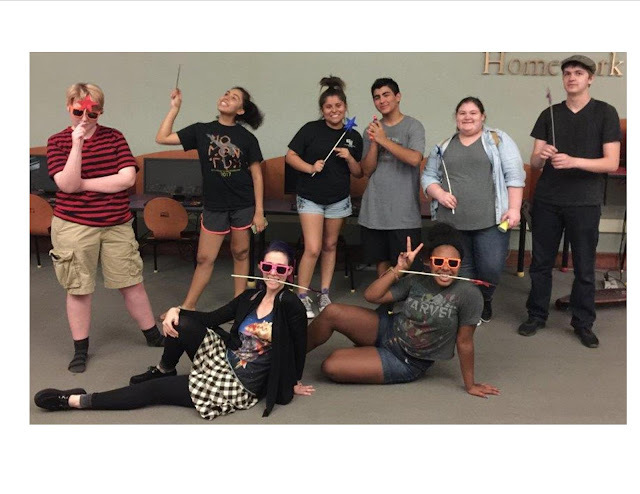 · Extra help will be needed at special events Thursday events at 11am and 3pm. You may also be asked to help schedule volunteers for our Lunch at the Library program, weekdays at 12:30pm. This will mean making sure the following hours are covered by at least one volunteer (or intern) at all times. Please note that individual, flexible schedules will be arranged between the intern and the library, based on library needs and intern availability. Please note that the award of the scholarship is dependent on your ability to adhere to your schedule and assigned tasks. If selected, you must complete your full internship to receive the scholarship. If you are dismissed for misconduct or failure to work your assigned shifts, you will not receive the scholarship nor will you receive a recommendation letter or reference from library staff. We will begin interviewing our top applicants on April 17th. 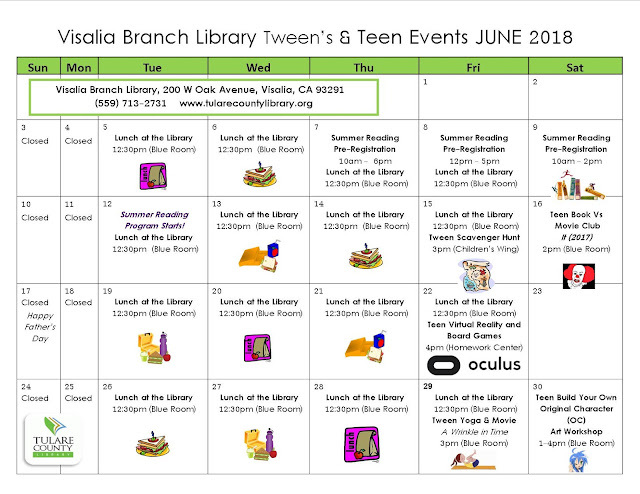 For more info, please call email Carrie.Wilson@TulareCountyLibrary.org or call 559-713-2732.